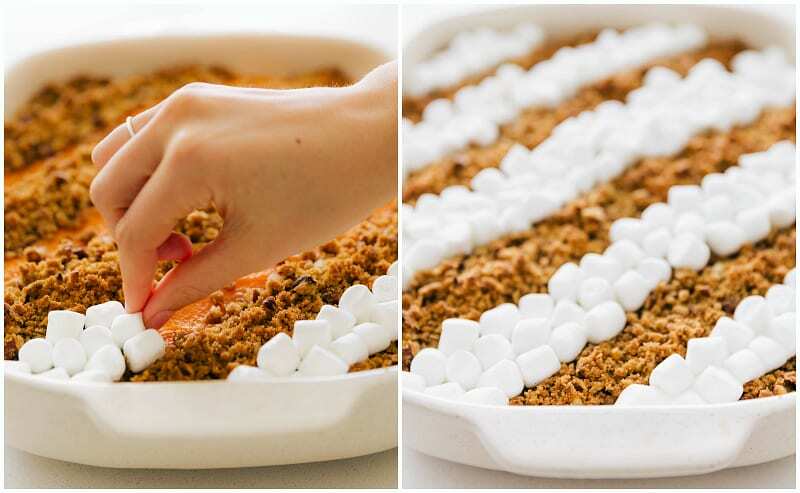 This classic sweet potato casserole recipe with a crunchy brown sugar pecan topping AND melted marshmallows is a must have for the holidays. If you’re serving this sweet potato casserole for Thanksgiving or Christmas, consider serving it alongside these mashed potatoes, a wild rice salad, roasted vegetables, Thanksgiving dressing, and/or this watergate salad. So I have to know (leave a comment!) — when do you decorate/begin getting ready for Christmas? 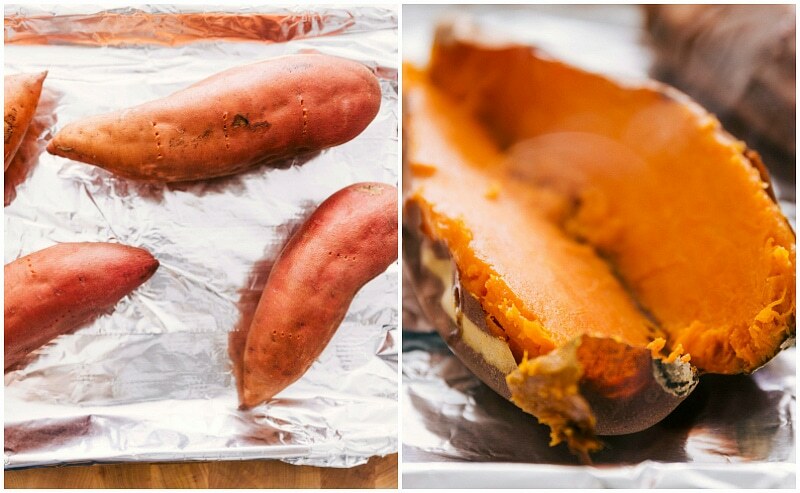 Bake the sweet potatoes until tender and remove the peels. To make a canned sweet potato casserole, you can use canned sweet potatoes, but for best results I recommend using fresh sweet potatoes. 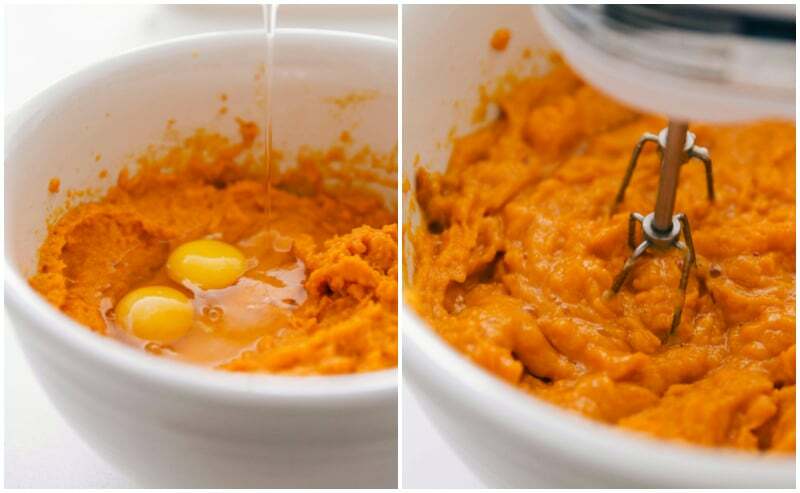 Mash the sweet potatoes and mix with the sugar, butter, vanilla, evaporated milk, cinnamon and salt. Smooth into a casserole dish. Prepare the pecan topping by mixing together chopped pecans, melted butter, brown sugar, flour, and a little bit of salt. Top the dish with this topping. Remove the casserole and add the marshmallows. Cook for an additional 4-8 minutes (until marshmallows are lightly golden). There are various toppings you can use on a homemade sweet potato casserole, and in this recipe I combine my two favorites: pecans and marshmallows. See my tips below for how to top your casserole with these two toppings! How do you make sweet potato casserole with pecans? The pecan topping in this sweet potato casserole recipe is both easy and delicious! Just combine the chopped pecans with melted butter, brown sugar, flour and salt and stir until you have a thick streusel-like mixture. 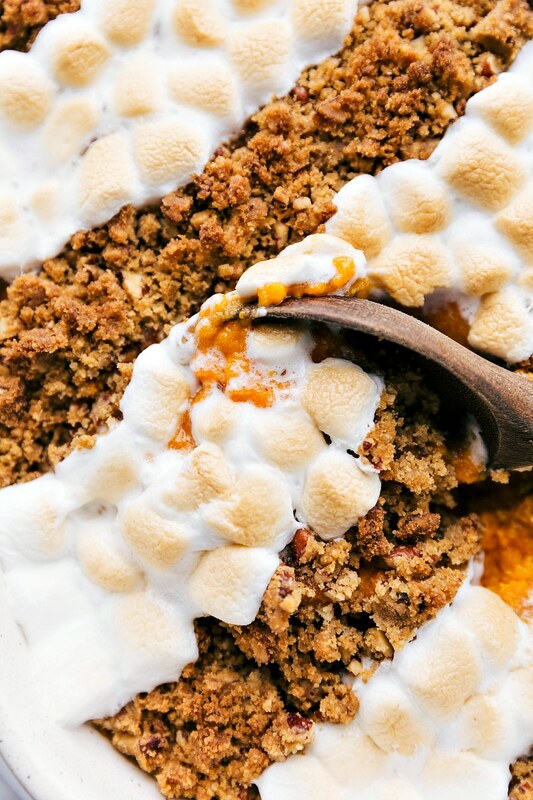 How do I make sweet potato casserole with marshmallows on top? Adjust the amount of marshmallows according to your personal preferences. After the casserole base has been cooked through, you’ll add those marshmallows on top and cook for an additional 4-8 minutes, or until marshmallows are a light golden color. Watch carefully so that the marshmallows don’t burn! 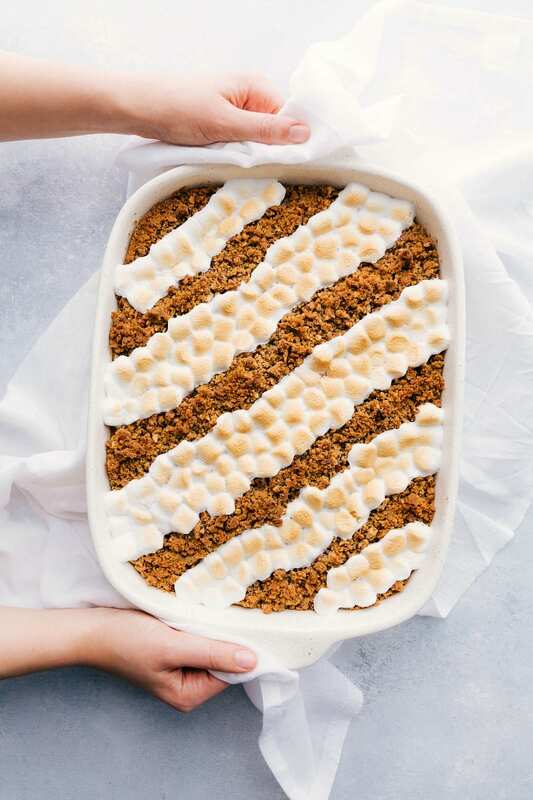 I think it’s delicious to combine both the pecan and marshmallow topping together, but it’s quite alright to pick just one and cover the entire sweet potato casserole with that topping. If you’re prepping for a holiday meal, the more you can do ahead of time the better! Luckily, this casserole is NOT one of the dishes you have to make the day of! To make this sweet potato casserole recipe even easier, you can prep the base up to 2 days ahead and the pecan topping 3-4 days ahead. Just don’t put the pecan topping on the casserole until you’re ready to bake it. I don’t recommend baking the casserole in advance. How long can you keep sweet potato casserole in the fridge? You can keep leftover sweet potato casserole in the fridge for up to 3-5 days. If you want it to taste as good as it did on the first day, I recommend scraping off the topping before storing in the fridge and warming the casserole with a fresh layer of toppings. 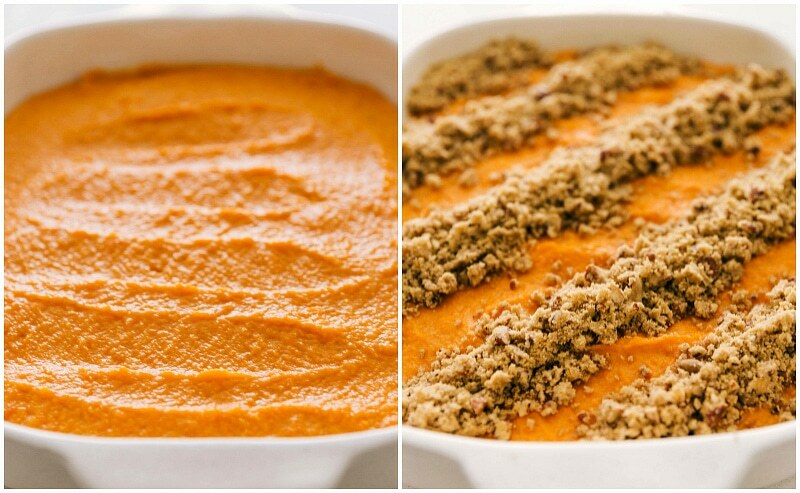 Can you freeze sweet potato casserole? While you can freeze the sweet potato base, I do not recommend freezing the casserole with the toppings on top. To freeze the casserole base, first make sure the base has completely cooled. Then, place plastic wrap directly on the sweet potato casserole. Place another sheet of plastic wrap around the pan. This double wrap will help prevent ice crystals from forming. Freeze for up to one month. 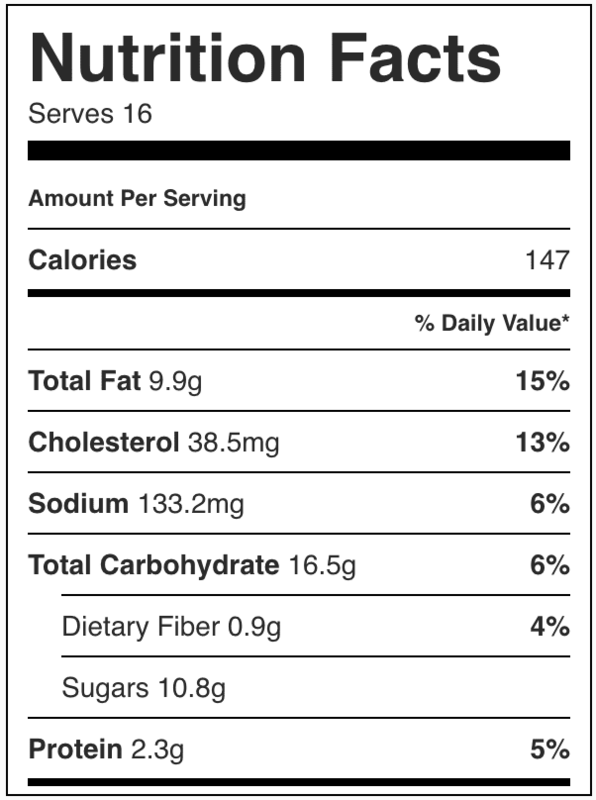 Can I make this sweet potato casserole healthy? Reduce the sugar in the base or replace it with pure maple sugar OR coconut sugar. Replace the evaporated milk with 1% milk (I do not recommend skim). For more ideas on healthy ingredient swaps, check out this recipe. 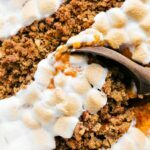 The classic sweet potato casserole with a crunchy brown sugar pecan topping AND melty marshmallows is a must have for the holidays. Plus directions on how to make this sweet potato casserole with just marshmallows or just pecans. If the skins don't come off easily, scoop out the flesh from the halved potatoes. Place into a large mixing bowl and mash the potatoes with a potato masher. Add in brown sugar, white sugar, butter, vanilla, evaporated milk, cinnamon, and salt. Blend, using electric hand mixers, on low speed until smooth. Add in eggs and beat until blended and smooth. 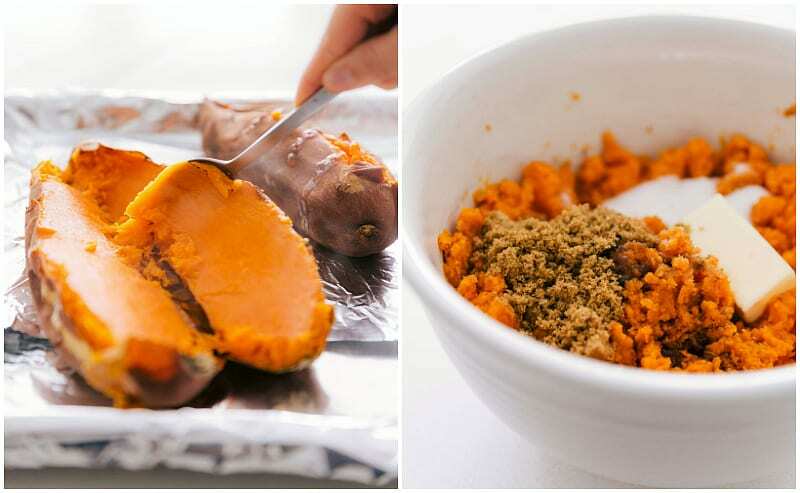 Reduce oven temperature to 350 degrees F.
Smooth the sweet potato mixture into a 9 x 13 pan. 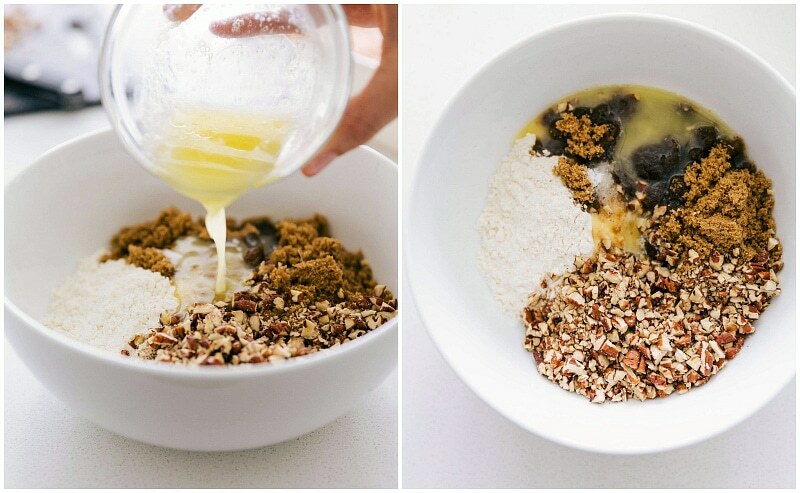 In a separate bowl, combine pecan topping: the melted butter, chopped pecans, brown sugar, flour, and salt. Stir until ingredients are well incorporated. Either top the entire casserole with this mixture or top in rows. If you opt to do rows (as pictured) you'll have about 1/2 cup extra of the topping; if you top the entire casserole, you'll use all of the topping. Bake in 350 degree oven for 30 minutes (tent with foil if streusel is browning too quickly). Remove casserole and add marshmallows (to desired preference) over the casserole -- either on top of the pecan topping or in between rows. If in between rows, you'll use about 1 and 1/2 cups. If you top the whole casserole, about 3 cups. Return to the oven and bake for 4-8 minutes or until marshmallows are melty and lightly golden (watch carefully!) Remove from oven and serve warm. MAKE IN ADVANCE: You can make this casserole in advance! Just follow these tips: store the pecan topping and marshmallows separately. 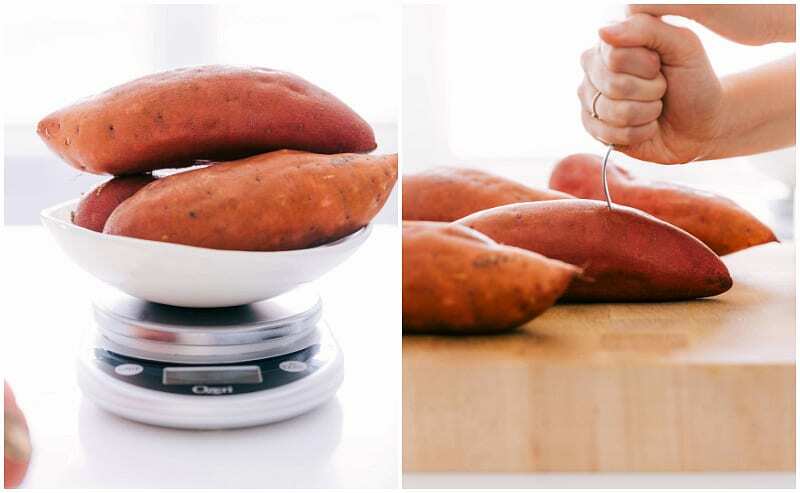 Cover the sweet potato casserole tightly and place in the fridge. When ready to bake, add pecan topping and place in the oven while it's preheating and then bake for 25-30 minutes once preheated. Add marshmallows according to recipe instructions.